Canines are beyond deserving of our attention, recognition, praise and honor for the manner in which they enrich human existence. Our relationships with dogs result in unleashed joy; adding purpose and filling our lives with unconditional love. 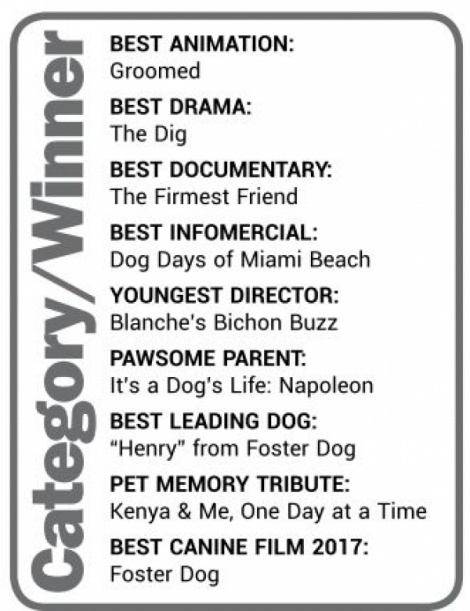 Three dog-loving women set out with big aspirations for the inaugural Canine Film Festival. Organizers Laly Albalate, Lory Nelson Brunner, and Karen Landrum celebrate the devotion of dogs and those who love them, while escaping the summer heat in a chilled movie theater. The festival opened with a Red Carpet Canine Spotlight, with plenty of pawparazzi present. Lucky dogs (accompanied by their owners) enjoyed a day at the movies at Cinepolis, Coconut Grove. Unique relationships, lives, humor and experiences were documented in 103 entries (short films) from around the world. The top 25 featured films were screened at the festival. Audience reactions were noted-dogs barked, people cheered and clapped. Popcorn was gladly shared. The following day, the Holly-woof after-party was held at Hotel Indigo, Miami Lakes.The morning began with a rejuvenating doga (yoga) experience for two and four-leggeds, led by certified yoga instructor, Tara Smith. Afterward guests enjoyed a sumptuous poolside brunch presented by Chef Yohanes, Hotel Indigo. Not to be left out, canines dined on an organic feast prepared by Chefs Laly and Eddie of the Doggie Bag Café. “The purpose behind the Canine Film Festival was to raise funds for local rescues and shelters in South Florida, while showcasing the love and relationships of our beloved pets and their owners," stated Laly Albalate, event organizer. Fifty percent of tickets sold benefited Boston Terrier Rescue of Florida, South Florida Fund for Retired K9 Law Enforcement Officers, Humane Society Greater Miami, Redland Rockpit Abandoned Dog Project, Cattorneys @ Paw Benefit, The Cat Network Spay Day Support, Paw Patrol Rescue and the Miami Veterinary Foundation. Getting Back to NatureLove WinsSports Traditions We Love – and Why We Love ThemMost Romantic Movies Ever!